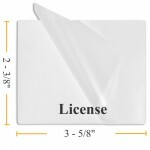 Drivers License Laminating Pouches Laminate Pouch Measures: 2-3/8" x 3 5/8" (60mm x 93mm). Available in 5 mil, 7 mil, and 10 mil thickness. Available Finishes include Gloss, Matte, Sticky Back and Color Backed.